One of my first stops when I hit the farmer's market is to grab a box of eggs. I love when I open up the box and see a variety of colors, sizes, and well, even the dirt on some of them. I'm happy to use some of these for our breakfast of baked eggs. I was also happy for an excuse to whip up a loaf of English muffin bread, too! I toasted a couple of slices up and cut them into batons or soldiers to go alongside. It's classic and I'm into that. Now...about baking the eggs. Ideally, if you're just baking one egg at a time, small, 2-3 ounce, ramekins are perfect. With a slightly larger ramekin, you can easily fit 2 eggs in at a time. The key really is to keep an eye on them if doing both because the single egg cooks quicker than the duo. I simply sprinkled the tops of the eggs with salt and pepper. As I mentioned, I drizzled the top with some milk, rather than cream. The extra liquid is meant to help the egg from potentially drying out. A little extra moisture doesn't hurt. I set my eggs (including the one I baked without a hot water bath) in a 350 degree oven. From there on, it's all about the timing and how you want your eggs done. Eventually, we all sat down and dug into our eggs, toast, and turkey bacon. That's always the fun part...and truth be told, I often can't wait to make the same thing I did again, without the photographing and rushing, so I can enjoy the process even more. I love breakfast and eggs! Preheat oven to 350 degrees. Have a small oven-safe baking dish (or one large enough to hold the number of ramekins you're baking if making more) as well as a kettle of very hot water on standby. Coat the inside of two small ramekins (2-3 ounce ramekins are ideal; if using larger 5-6 ounce ramekins, fit two eggs into each) with some olive oil. Carefully (so as not to break the yolk) crack an egg into each. Sprinkle the tops of the eggs with salt and pepper, then top each with a teaspoon of milk. Set ramekins into the baking dish (you can line the bottom of the baking dish with a dish towel to prevent the ramekins from sliding when moved) and fill the dish with very hot water, about halfway up the sides of the ramekin. Carefully transfer to the oven. Bake until whites are set. For a soft, slightly-runny egg yolks, this takes roughly 18-20 minutes. Keep a close eye on the eggs near the end of the bake time to avoid over-cooking and bear in mind that bake time may take longer if you're using larger ramekins and baking two in each. What gorgeous eggs from your farmer's market! I love all those colors and specks! And I can't believe I'm admitting this but I've never had baked eggs .... I feel ashamed :) haha I keep meaning to make them and then just always forget on the weekends! I must fix this soon! I can't resist those green and blue ones...their shells are thicker, too. Definitely no shame in the lack of baked eggs...I have been thinking of making them at home for, oh, 10 years...so better late than never. Those farmer market eggs are so great! I have to try the baked eggs in water batch next time too. It looks really smooth. I've never attempted baked eggs at home either, though I love eating them at restaurants. Not sure why I haven't tried to make them myself! I think it's about time seeing as how they're really not harder than poached eggs! I knew I wasn't alone! : ) Honestly, my favorite thing is still a good fried egg and since that takes about 60 seconds or so to make, it's hard to get 'cracking' on making these baked eggs. It feels like a ton more effort compared to that other 60 seconds. Thats said, it's fun to mix things up once in a blue moon. haha - sounds great! I love the idea of toast 'soldiers' for dipping into a runny egg yolk. Thanks, BAM! Oh I want this sooo bad this morning! Thanks for the craving! This was a really information post. I've never baked eggs before, and now I'm looking forward to trying. And I'll be sure to use a water bath! Hi Monica, Love eggs like this, I think they are better baked in a water bath too, love your little soldier toast and the English muffin bread as well. Glad I could be of some tiny use. haha. 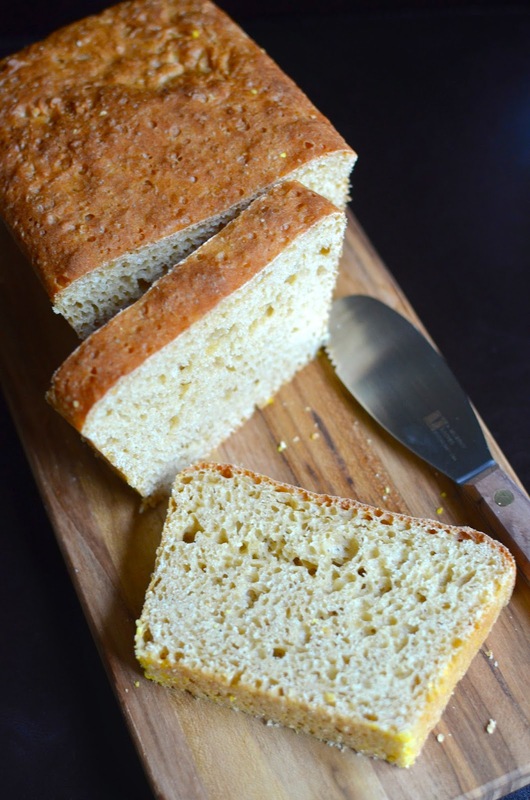 The English muffin bread is so darn easy and it's great to whip up every now and then. Glad you like it! I never realized a water bath made such a difference- this is a great post! i've never once seen baked eggs on a restaurant menu - obviously i'm not hanging out in the right places. :) and i've never tried them at home, but this has inspired me to do so: i think they sound luxurious also, and i've wanted to try them, but i just chicken out and do "normal" eggs. definitely trying this...WITH water bath. It's pretty rare but some places that specialize in breakfast/brunch have them and I will associate and remember a restaurant that does serve it. Baking them in a flatter gratin (flan) type dish is nice too and you can do two eggs in there, add something to them or not...too many options and sometimes that's a deterrent to being practical at home. I loved baked eggs, and you definitely nailed this tutorial! I'm definitely trying a water bath next time. I don't know about tutorial but my little 'experiment' satisfied my curiosity. : ) Thanks, Jessica. Sure, I'll adopt your professional advice, and soon to enjoy breakfasts with such nicely baked eggs. Just wondering if the water-bath method is first created for eggs or for cakes : ). I don't think I knew you could bake eggs! I have baked them in their shell before, but not cracked. I learn something new every day! They look good, and I love eggs - so this is a great idea! Love that...it's always nice to see something new. I learn something everyday, too. Definitely delicious and worth to try baked egg recipe!! Why don't you have your own restaurant! It's your destiny! Delicious! I've seen this method of cooking eggs before (numerous times) but I never actually paid attention to the recipes or read in detail. This is such a great idea. I want my kids to have protein in the morning. They don't like boiled eggs that much, but this is PERFECT. I can pop the eggs in the oven (or maybe premade previous night...while cleaning up the dinner etc) and it's ready! Frying eggs takes short time but I just need to be around...and paying attention. Love this egg in ramekin. Thank you for introducing this recipe!! My son liked these though he usually prefers fried eggs of some kind. The first time you make these, you'll have to watch it close to make sure it doesn't overcook...but once you know, I think it's much easier thereafter...Thanks, Nami! Oh I love this post and your random tests! I too feel a water bath provides a uniform and delicate texture to the eggs. I bake eggs frequently with whatever is available as add-ins especially the Chakchouka kind. Your tips are fantastic. keep them coming! haha - yes, I'm totally random but this satisfied my curiosity. Having leftovers and chopping them up to add into these is a wonderful idea! A nice baked egg or two for your weekend breakfast...sounds good to me!